AgroAtlas - Relatives - Poa alpina L. - Alpine Bluegrass. Perennial grass that forms dense turfs. Stems 5-10 cm tall, glabrous. Leaf sheathes glabrous; ligula 4 mm long; leaves are numerous, linear, rather thick, up to 5 mm in width. Panicle is dense with short branches. Spikelets ovate, variegated in color, with 3-7 flowers. 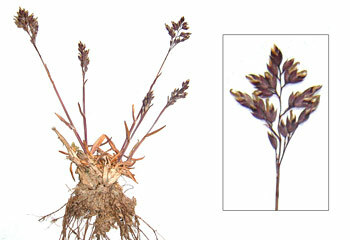 Glumes lanceolate, almost equal to each other in size, with very short awns. Lemma has slight ribs, lateral rib and pubescent keel. Blossoms in July; seeds ripen in August. Apomictic plant. 2n=14, 34, 42. Occurs in the Arctic zone, the Northern European part of Russia, the Caucasus, the mountains of Central Asia, Kazakhstan, Siberia, Chukotka, and the Carpathian Mountains in Western European part of the former USSR. Occurs in steppe alpine and sub-alpine meadows. Occurs on different tundra, along rocky seashores, and in the forest zone. One of the best pasture plants of high-mountain meadows. Grossheim A.A. 1939. Flora of Caucasus. Vol. 2. Baku: AzFAN, pp. 587. (in Russian). Harkevich S.S., ed. 1985. Vascular Plants of the Soviet Far East. Vol. 1. St. Petersburg: Nauka, 390 p. (in Russian). Hulten E., Fries M. 1986. Atlas of Northern European vascular plants north of the Tropic of Cancer. Vol. 1-3. Konigstein, 1172 pp. Pavlov N.V., ed. 1950. Flora of Kazakhstan. Vol. 1. Alma-Ata: AN Kazahstan SSR, 354 pp. (in Russian). Shelyag-Sosonko Y.P., ed. 1977. Grasses of Ukraine. Kiev: Naukova Dumka, 518 pp. (in Russian). Tolmachev A.I., ed. 1974. Arctic Flora of the USSR. Vol. 1. L.: Nauka, 75 pp. (in Russian).